Most of us live our lives according to a mental plan we keep in our heads – and when it comes to our Praxis Business Education practice test, we tend to follow the same route. We carve out a certain time every evening after dinner to take some Praxis practice test questions in our prep book. We refuse to do anything on weekend afternoons, as we've reserved that for our study time. We carry around flashcards in our bags during our commute to work or school, hoping to get in a few precious minutes of study time. And heaven help us if we ever break our Praxis Business Education study plan – because that makes us feel like an instant loser! While it's great to be so dedicated to your review, there's a blatant dilemma that's staring you right in the face. And unless you get ready to tackle it head-on, this problem can rear its ugly head and ruin your Praxis test score. It's has nothing to do with your memorization techniques, or your efforts to relearn practically every math formula you've studied since elementary school. Get ready for a shock – because the real culprit is your rigid Praxis Business Education study guide plan. You can apply some of these test practice tactics to other ETS exams like the Praxis Physical Education, Elementary Education, Math, Science and Social Studies. When it comes to using Praxis Business Education study guides and practice tests, we tend to follow a certain set of rules that are presented to us. But think of it this way: those Praxis Business Education practice tests and prep guides have no idea who you are. They have no idea when your peak study times are – or the best techniques you use for memorizing tricky subjects. Therefore, following a set of rules that don't have you in mind is the very definition of crazy. So how can you make your Praxis Business Education prep more flexible – not to mention allow more time for your idiosyncrasies and special quirks? Perform a Praxis Business Education exam prep audit. Take a look at what you're using to study for the test – and then ask yourself if it's truly helping. Test prep experts often say that when you hang on to useless review habits and mediocre-level study materials, we actually make ourselves feel as though we have so much more test preparation to do. Do your brain a favor and chuck that Praxis Business Education book that’s riddled with grammar errors and spelling typos. Don't allow yourself to get overwhelmed when you can cut-out so much time-wasting Praxis Business Education practice exams and book material that isn’t going to appear on your testing date. After you’ve reduced your preparation material down the essentials to achieve a passing score, break the remaining review material down into manageable tasks. When taking Praxis Business Education practice test questions, don’t be self-critical. While practice questions are designed to help us turn inward and examine what we need to work on, too many people take this as an opportunity to criticize. You've got nothing to gain from this attitude, so try to acknowledge and accept your weaknesses for what they are. Instead use sample questions as a tool to further reduce time wasting test prep time by only focusing on the narrowest core of subtopics you need to raise your score to passing-level. Want more hard-ripping Praxis Business Education help? "Why Not Pass The Praxis II Test Now and Tell Your Own Success Story?" It actually covers the real Praxis II! FREE Praxis II practice questions (just like the exam). By real licensed teachers who passed. 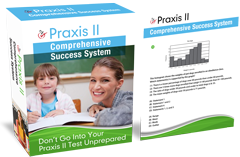 Get FREE Praxis II Study Guide Now!